The latest version of our popular risk analysis tools, @RISK 7.5 and DecisionTools Suite 7.5 are now available! Version 7.5 offers a range of improvements for any decision maker, from general use enhancements to new, specialized analytical features. New and enhanced graphing options, faster performance, and sophisticated analytics make DecisionTools Suite 7.5 the only decision analysis toolset you’ll ever need. Join Us for a Free to Learn More About What’s New In @RISK 7.5 and DecisionTools Suite 7.5! Getting life-saving drugs to under-served people in developing countries is a driving goal for many non-profit organizations. However, well-intentioned efforts like these can fall short of their desired impact due to poor understanding of market uncertainty and risks associated with pharmaceutical manufacturing. Linskbridge, SPC, a consulting firm that advises international development organizations in determining what efforts have the highest impact along with the best value for money spent, recently used @RISK, RISKOptimizer, and PrecisionTree to help determine the best method of introducing a life-saving medicine in developing countries. The process requires analytical forecasting of both demand and supply of the drug, as well as a detailed market analysis. With the aid of Palisade’s DecisionTools Suite software, the consultancy has been able to offer clients sound advice on which ventures have both humanitarian impact and fiscal soundness. Khatuna Giorgadze, an associate with Linksbridge SPC, was able to take complex data from multiple sources and translate it into clear and comprehensive information. For example, she used @RISK to create a demand forecasting model, which included both static inputs like population data from United Nations Population Division, country census data, and World Health Organization coverage data, as well as probability distributions for highly uncertain inputs that represent a range of possible values. Thus she was better able to predict the demand for a drug or medical treatment in developing countries. She was also able to forecast supply. This step “is even more uncertain than demand,” Giorgadze says, “so we use @RISK to a great extent to assess manufacturing risks and supplier’s plans in the market.” With supply and demand established, Giorgadze then used @RISK, RISKOptimizer, and PrecisionTree to do a thorough market analysis. She then investigated different investment options for the company, determining the potential benefits and risks of each. 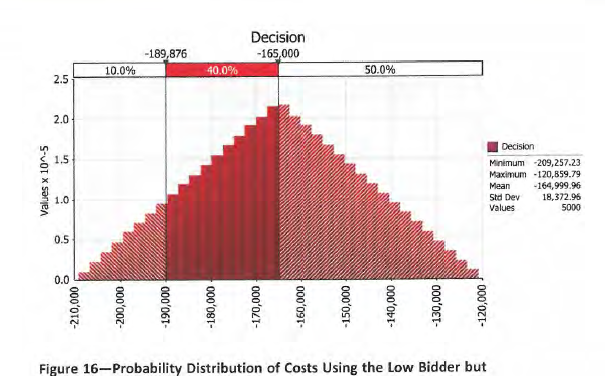 Palisade’s PrecisionTree software was featured prominently in Cost Engineering Magazine’s July/August 2014 issue. The article “Use Decision Trees to Make Important Project Decisions,” by long-time Palisade software user Dr. David T. Hulett, describes how decision trees can help decision makers choose between multiple options and take account of cost and rewards of different options. The article “forms the foundation of a new AACE International Recommended Practice,” and examines two different approaches to making a decision: maximize expected monetary value, which is a hallmark of a risk-neutral organization, or, maximize expected utility, which is the appropriate measure of merit for a risk-averse or even a risk-seeking organization. Both approaches benefit from the use of decision trees, as well as optimization and Monte Carlo simulation, to better select and represent alternative outcomes. For anyone interested in incorporating decision trees into their decision making, consider checking out Palisade’s PrecisionTree software; it allows you to visually map out, organize, and analyze decisions using decision trees, right in Microsoft Excel. The Hepatitis B virus is 100 times more infectious than HIV, and kills more than 780,000 people each year. It can cause a potentially life-threatening liver infection often leading to cirrhosis and liver cancer. It’s also preventable with a series of vaccinations. Yet throughout the past 30 years, the U.S. Preventative Services Task Force (USPSTF) had calculated the societal cost-benefits of universal Hepatitis B screening, and found that screening the entire US population was not worth the cost. Dr. John Fontanesi, Director of the Center for Management Science in Health at University of California San Diego School of Medicine, and his team of researchers led by Dr. Robert Gish, M.D., have helped to change this policy. After dedicated field work, @RISK modeling, and PrecisionTree analysis, the researchers found that, rather than screening the entire US population, targeting key at-risk groups would indeed result in worthwhile health outcomes. The research team knew that in some Asian immigrant communities, the rate of Hepatitis B infection can be as high as 16-18%. They studied two very different groups of Asian immigrant communities: one made up of university students and faculty with relatively high socioeconomic status; the other made up of Laotian and Hmong and Vietnamese immigrants with lower socioeconomic status. Using Palisade software, the researchers determined which type of screening test to administer, and what location was most effective (e.g. health clinic versus community event), when considering widely different segments of the Asian immigrant population. Dr. Fontanesi’s findings have spurred the USPSTF to re-write their recommendation to include targeted screening of Hepatitis B in certain Asian communities and populations. A major electronics retailer was in trouble—their financial services department was near extinction, and needed to find a way to create greater savings. As a solution, they looked at increasing the issuance and utilization of its private label credit card (PLCC) to offset some of the nearly $370 million in annual interchange fees (the transaction fee charged to merchants for using the cards) related to arbitrary rates imposed by issuing banks and card brands. This idea was easier said than done—it required an entire corporate culture shift and a relationship reestablishment with its two issuing banks—all within an eight-month period. To get buy-in from the company’s decision-makers, there needed to be clear data that showed that the strategy was likely to succeed. The company enlisted the services of Nighthawk Intelligence to examine inefficiencies in the PLCC application process and effectiveness of marketing campaigns geared toward PLCC holders. Drew Pulvermacher, founder and chief probability officer at Nighthawk Intelligence, utilized StatTools, @RISK and PrecisionTree—all part of Palisade’s DecisionTools Suite—to help the retailer with this process. Using StatTools, Pulvermacher was able to show how a marketing campaign to promote customer PLCC sign-up would affect consumer activity, allowing the retailer to adjust the messaging and price appoints to achieve the greatest likelihood of success for each marketing campaign. Additionally, using @RISK and StatTools, Pulvermacher was able to build a distribution library, which the retailer could use to audit variable assumptions. Pulvermacher also used PrecisionTree to determine how best to streamline the PLCC application process (customers could get deterred by long wait lines at the customer service desk). Using PrecisionTree, Pulvermacher mapped out a series of customer decisions that took place when making purchases and where their interest in making a purchase broke down, and identified the departments that would benefit most from a faster, more efficient application process. Within a year of implementing the strategy towards expanded PLCC usage, the company realized nearly $250 million in related accrued benefits, which included interchange savings, financing income, and enhancement services. Instead of finding a way to justify its existence, the financial services department became a vital part of the organization’s fiscal success. “Palisade…offered the resources necessary to quickly transform an entire organizational mind-set to embrace uncertainty and embed a systematic process of measuring performance,” said Pulvermacher.